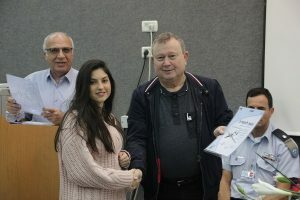 In an impressive ceremony, held recently in the auditorium of Sci Tech Israel Aerospace Industry High School in Lod, 20 graduates of the RPV Programme (running for the fourth year) were given qualification certificates. This qualification will honour them with the privilege of serving in the technical wing of the Israeli air Force, and the authority to maintain Remotely Piloted Vehicles during their military service. The qualified students are all continuing their studies in Sci Tech Israel Aerospace Industry College, towards a certificate in practical engineering. The ceremony was attended by all the students in the school’s RPV Programme, including the “freshmen” from 9th grade, some of whom may join this desired programme next year. Honorary guests included Mr. David Dagan, Executive Vice President of Operations at Israel Aerospace Industries (IAI) who also acts as chairman of the school’s board of directors, Mr. Nahum Samuel, General Manager of IAI’s MHT Division, Mr. Yoram Holtzberg, General Manager of IAI’s MALAT Division, and a respectable entourage of Air Force officers headed by Major Ilan Iluz, Head of Qualifications Department in the Air Force HQ. Four graduates – Ron Nethanel, Lyn Edri, Ilan Zisin and Lihi Danino – graduated with distinction, for their outstanding success in the Air Force’s qualification exams. The School’s Head, Mr. Yehuda Chorev, stated that “the RPV Programme is the flagship of the programmes in our vocational high schools, drawing high-quality students. It is a shining example of a successful implementation of the vocational model – theoretical and technological studies in combination with practical work in a high-knowledge industry such as the IAI. “We wouldn’t have been able to reach such achievements without the support of these two factories, MHT and MALAT,” said Mr. Horev. 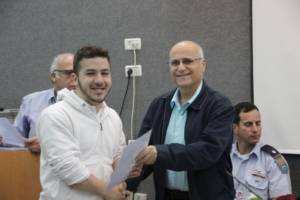 He added that the RPV Programme has been nominated this year for the prestigious Sci Tech Education Award, and for him winning this award will wrap up things nicely, since the school had been previously awarded in previous years for the longer-standing programmes of electricity and mechanical engineering. Mr. Nahum Samuel, General Manager of IAI’s MHT Division, and Mr. Yoram Holtzberg, General Manager of IAI’s MALAT Division, emphasized the pride and satisfaction they feel whenever they are present at the qualification ceremony. The expressed their appreciation and respect to the qualified and dedicated team of management and teachers, and promised to happily continue in assisting the school with any request in future years as well. Mr. David Dagan, Executive Vice President of Operations at Israel Aerospace Industries, thanked everybody who’s been involved in the programme and expressed his hope that “The graduates will return, after their military service, to take on technical and managerial positions in the IAI.” We would like to note that Mr. Dagan is leading the construction of the school’s new and complex building, through a joint investment of the Labor Office, Sci Tech, and the Israel Aerospace Industries.